Dear friends, we are God’s children now (justification), and what we will be (glorification) has not yet been revealed. We know that when He appears, we will be like Him because we will see Him as He is. And everyone who has this hope in Him purifies himself now – (sanctification) just as He is pure. There is only one salvation, which is a gracious gift of God, and is accessed by faith alone. But salvation is a like a beautiful flower that buds; blossoms and then gives fruits. It’s a single concept with differing forms: 1) justification; 2) sanctification; 3) glorification. These three sparkling gems unite into the unique gift of God’s grace – SALVATION. Salvation is triangular, as it has a three distinct tenses – a past; a present and a future -and many passages show a clear distinction between these three grammatical forms, but Salvation also has its roots in the Creator – for it is eternal and it is indivisible. Salvation is ONE and yet salvation is THREE – for we were saved at a single point in time:- (justified) We are being saved through the passage of time:- (sanctification) and at a point in time, known only to God, we will be finally fully saved:- (glorified). 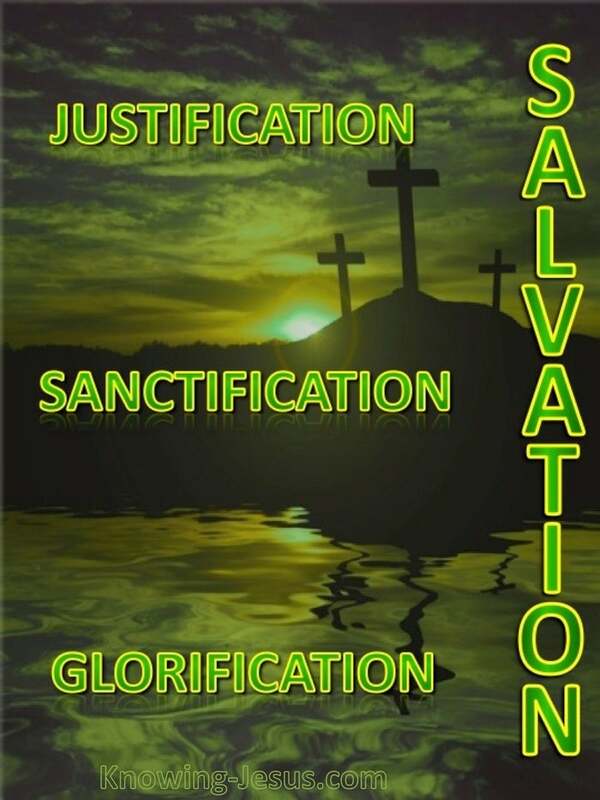 There are not 3 salvations, but ONE gift of grace that is accessed by faith, in Christ, God’s 1 gift of salvation has 3 elements – 1) justification, 2) sanctification and 3)glorification. It is vital that believers understand the simplicity and the complexities of salvation, for a misunderstanding of salvation can cause misinterpretation of the Word of God. 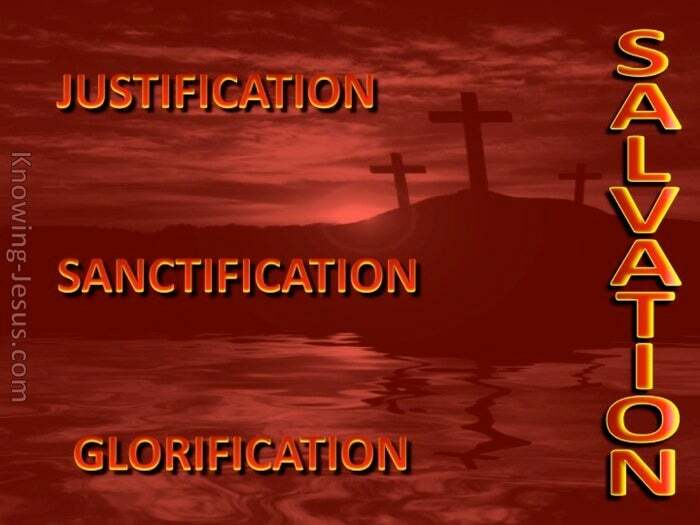 It is therefore essential to distinguish between these three stages of salvation.. We need to know the meanings of justification, sanctification and glorification. There are many passages that distinguish between these three tenses of salvation, In 2 Timothy 1:9 we discover God saved us – a past event, that took place at a point in time, when we were saved from the penalty of sin i.e. eternal separation from God. Salvation in this verse is given the term, justification – for we are justified by grace. Although we were not made righteous in a practical way – for we still have an old sin nature, this was the point we were positioned “in Christ” – and imputed with His righteousness – and from then on we had a right standing with God – JUSTIFIED. This is the point in time when we were born again – by believing in the work of Christ. In this verse Salvation is a done deal – a past event, when we were made righteous. Justification is a past event – and is the first of three meanings of SALVATION. In 1 Timothy 4:16 Paul is seen reminding Timothy to persevere in the things of God – which will ensure SALVATION both for himself – and for all who hear him teach. Salvation in this verse is given the term sanctification – for we are sanctified by grace. Timothy, who was already saved in the past from the penalty of sin, is now being instructed on how to be saved in the present, from the POWER of sin – for he, like all believers, is in the process of being saved in his Christian life – SANCTIFICATION. Although justification happens at a point in time – sanctification is a life-long process. Sanctification is an ongoing, life-long process in a believer, BUT though God desires all His children to be sanctified – not all believers are willing to be set apart unto Him. Being positioned “in Christ”, when we were justified, means we were also positionally sanctified that very moment in time – we were positionally set apart unto God, but because we have free-will, we can choose whether or not we want to be sanctified. Though positionally sanctified at rebirth – practical sanctification remains a choice. God wants all his children to be sanctified and set apart unto Him, just as the Lord Jesus Christ sanctified Himself unto God – but He will never force His will on any of us. God desires all His children to willingly say, Thy will, not mine be done, just like the Lord Jesus Christ – but He will never violate our volition, should we choose to refuse. God longs that all his children chose to be sanctified – set apart unto Him by offering themselves as a willing sacrifice, and submitting to the Spirit’s leading – for when we are being sanctified we’re blessed with continuous deliverance from the power of sin. All His children are positionally sanctified – but not all are being practically sanctified. The final element of Salvation by grace is the glorification of our bodies, and when this third element of salvation is complete we will be like Him for we shall see Him as He is. In 1 Corinthians 15:52 Paul tells us a mystery: We will not all sleep, but we will all be changed in a flash, in the twinkling of an eye, at the last trumpet. We know that when He appears, we will be like Him for we shall see Him as He is. And everyone who has this hope in Him purifies himself (through practical sanctification, during the present age) – just as the Lord Jesus Christ is pure. There is only one salvation, which is a gracious gift of God – accessed by faith alone. We’re justified by grace; sanctified by grace and glorified by grace – thru faith in Christ, and these 3 sparkling gems unite into God’s unique gift of grace – SALVATION.